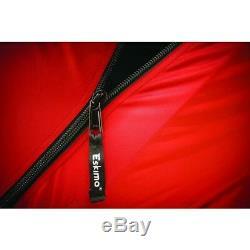 INSULATED ICE SHELTER Portable Fishing Shack Camping Hut Thermal Fabric Man Tent. 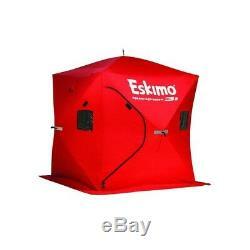 INSULATED ICE SHELTER Portable Fishing Shack Camping Hut Thermal Fabric Man Tent As the innovator of the first pop-up portable ice fishing shelter, Eskimo knows a thing or two about building the worlds best on-the-go portables. 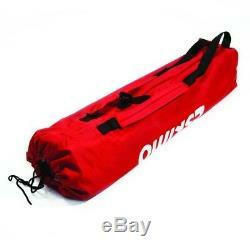 Dont be fooled by imitation shelters with flimsy hubs, weak poles and cheap fabric. The QuickFish Series is the original and still the best. Constructed with sturdy hubs, strong poles, ample storage pockets, reinforced bottoms, YKK zippers, self-tapping ice anchors and removable windows, the QuickFish is built to last season after season. Adjust your shelters ventilation with detachable hook and loop windows. Extra-long skirt helps eliminate drafts and keep elements out. Fully insulated- IQ insulated fabric is 35% warmer than a comparable non-insulated shelter. Self-tapping ice anchors that are easier to grip and will not bend under pressure. Everything fits into a bag that you can easily carry on your back. Heavy-duty material sewn over corner joints for reinforcement. The item "INSULATED ICE SHELTER Portable Fishing Shack Camping Hut Thermal Fabric Man Tent" is in sale since Wednesday, January 30, 2019. This item is in the category "Sporting Goods\Fishing\Fishing Equipment\Ice Fishing Accessories". The seller is "v8dstore" and is located in Phoenix, AZ. This item can be shipped to United States, Canada, United Kingdom, Denmark, Romania, Slovakia, Bulgaria, Czech republic, Finland, Hungary, Latvia, Lithuania, Malta, Estonia, Australia, Greece, Portugal, Cyprus, Slovenia, Japan, China, Sweden, South Korea, Indonesia, Taiwan, South africa, Thailand, Belgium, France, Hong Kong, Ireland, Netherlands, Poland, Spain, Italy, Germany, Austria, Bahamas, Israel, Mexico, New Zealand, Philippines, Singapore, Switzerland, Norway, Saudi arabia, Ukraine, United arab emirates, Qatar, Kuwait, Bahrain, Croatia, Malaysia, Brazil, Chile, Colombia, Costa rica, Panama, Trinidad and tobago, Guatemala, Honduras, Jamaica, Viet nam.